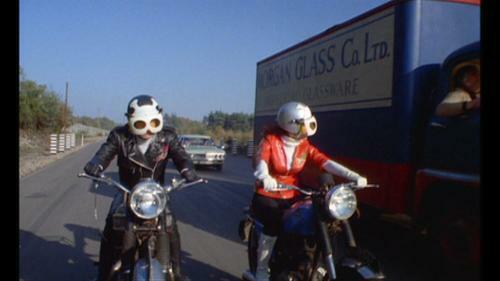 Psychomania, (aka. 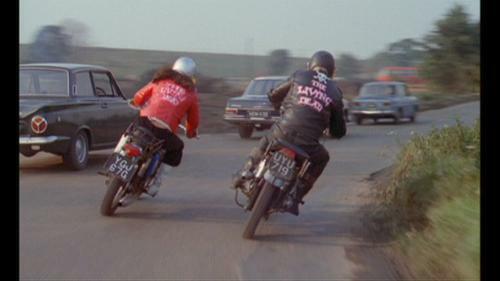 The Death Wheelers) was a low-budget film. 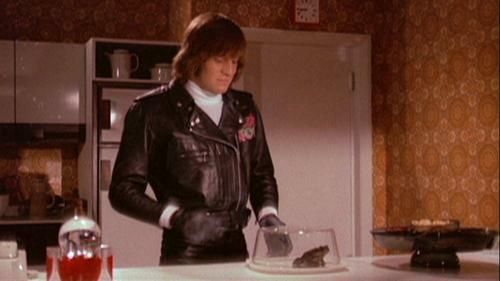 Although production was based at Shepperton Studios, the majoriy of the film was made on location to keep costs down. 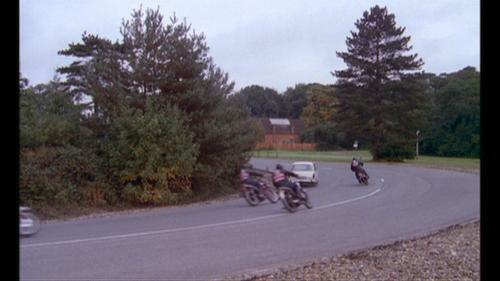 The film was made within 5 miles of Shepperton and down the M3 between Junction 1 and 3. 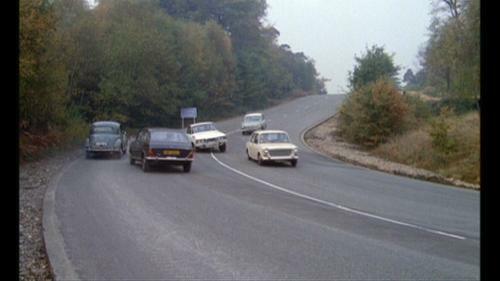 The M3 was being constructed at the time and so there was no real traffic flowing. 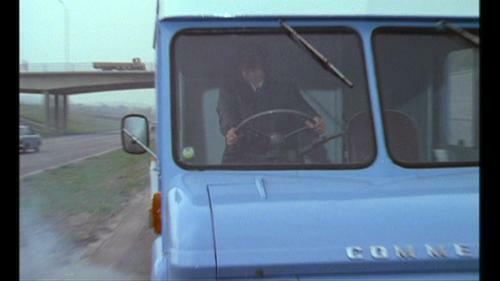 The production company therefore had freedom to use the motorway without interruption. 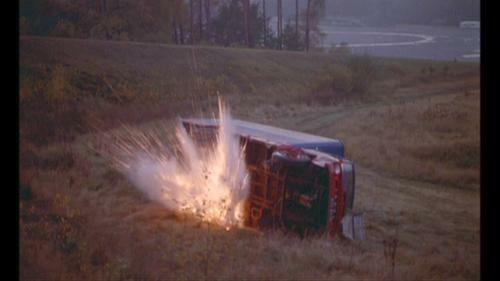 You can tell this for example when Abby pulls over just before Tom kills himself. 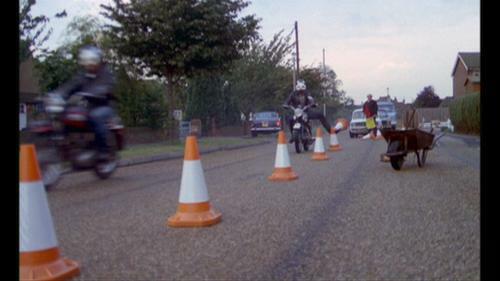 She parks between two oil drums on a central reservation which has yet to get its crash barriers. 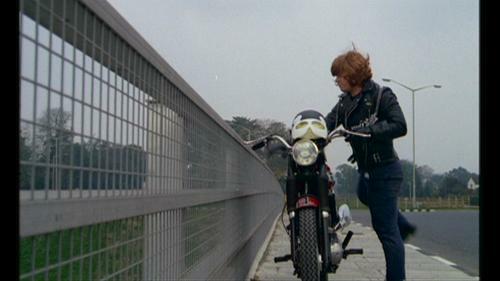 Also, as you see Tom riding off the bridge into the Thames, you can see an Earth-Mover parked on the opposite bank. 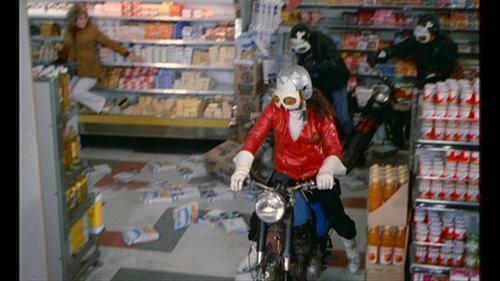 In spite of awful reviews at the time, Psychomania has remained a cult movie since its release 40 years ago. 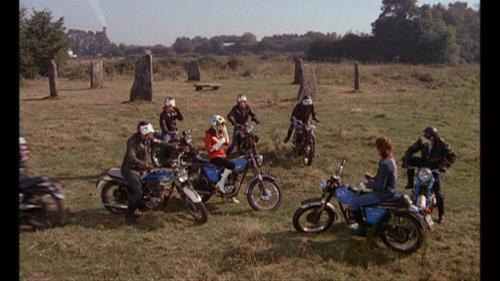 The most expensive part of the film's production was the creation of an imaginary stone circle near to Shepperton, which many fans of the film still believe to be a genuine circle. 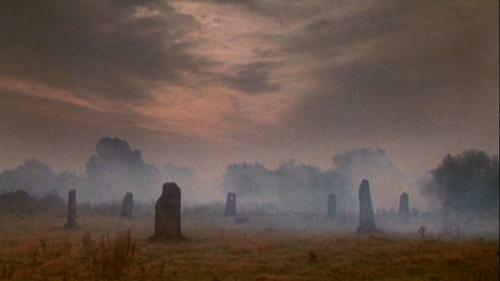 The most commonly held belief of fans is that the stone circle scenes were filmed at the Rollright Stones in Oxford and many wrongly go on pilgrimmage there. 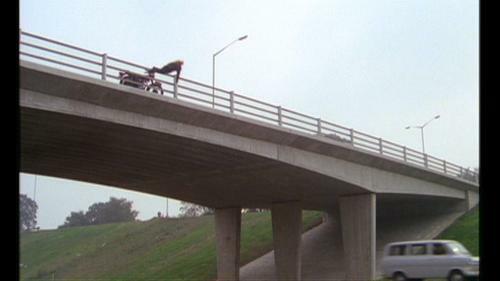 In part to dispel this myth, I have created this guide to the locations used in Psychomania. Some of the locations I don't know, so if anyone can enlighten me, my email is at the bottom. 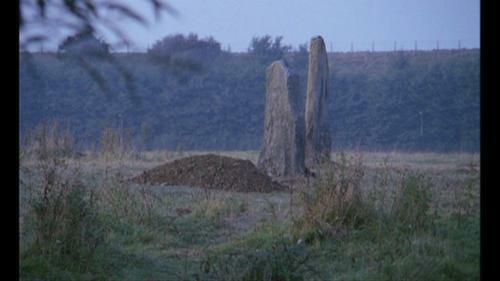 The stone circle was constructed for the film near to Shepperton Studios and to the south of the Queen Mary Reservoir (which can be seen more clearly in screenshots Nos. 13-16 below). 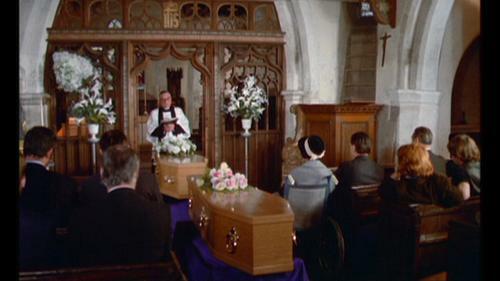 Filmed in the Graveyard of St Mary Magdalene, Squires Bridge Road. 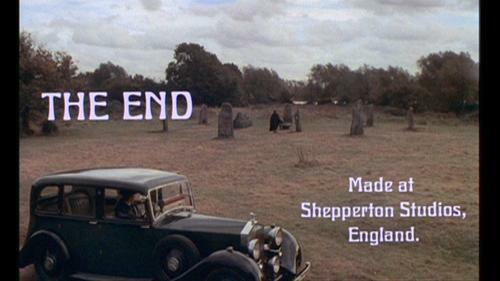 Next to Shepperton Studios. Interior of Shepperton Old House, on the Shepperton Lot. 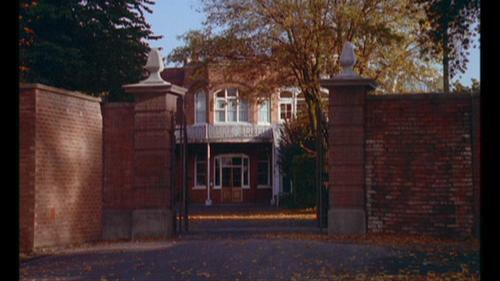 This is a studio set, not part of the house seen in screenshot 35. This view is looking across towards M3 (behind treeline) The Chimney to the left is part of the gravel works and has now been replaced by a garden centre. 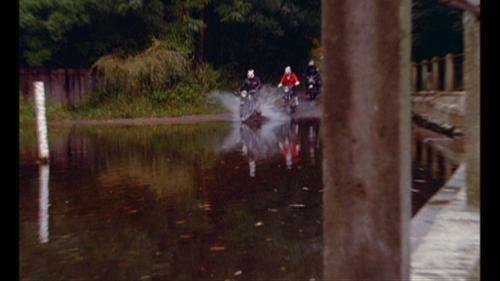 Just outside of 149 Watersplash Road (just up the way from Scene 7 above). 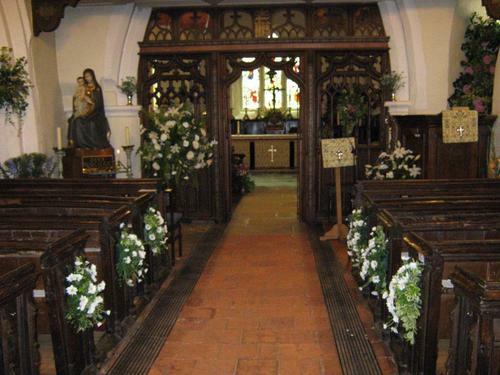 Thanks to Mr Lloyd for Identifying the location. This area has now been redeveloped. 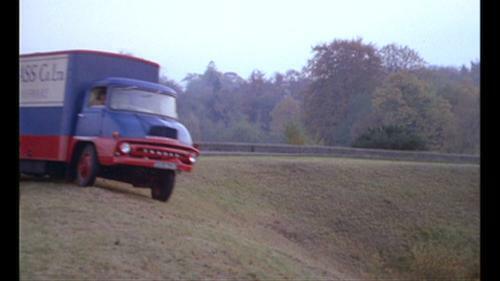 MOD Military Vehicle Test and Evaluation Track, Barrow Hill, near Longcross, Surrey. The green arrow on the map link pinpoints the exact spot on the site. Close-up of Tom's Grave, showing the railings on the edge of the reservoir to the North. This is the entrance to the field where the stone circle was built. 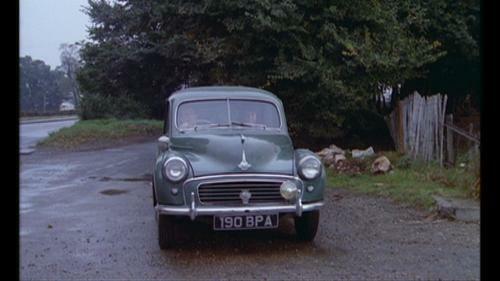 The right turn behind the Morris has been widened, so the little triangular island of grass you see behind the car and to the left is now gone. 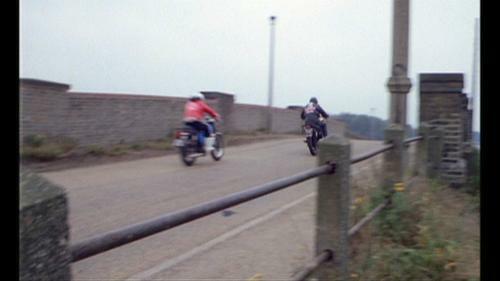 You can see the edge of the Queen Mary Reservoir at the top-left of the screenshot and a car passing on the road at the edge of the field. Today the path from the entrance of the field remains the same. 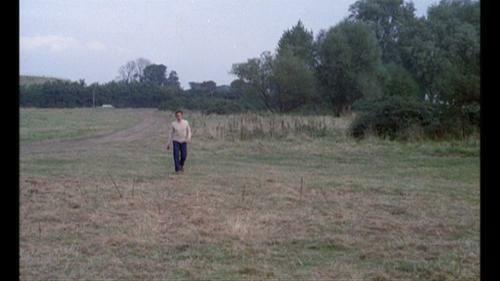 The map reference and the green arrow on the linked map pinpoint the exact location of the man on the field. 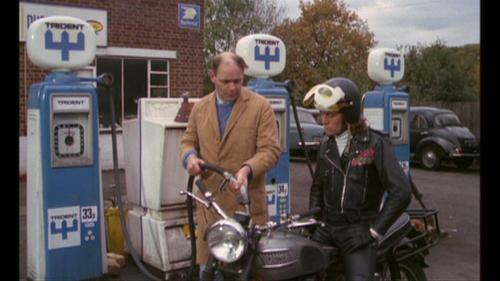 This petrol station is likely to be made up. 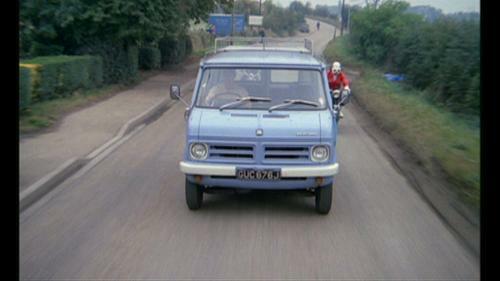 The fuel being sold (Trident) was a small Kent oil company and did not deliver to the Shepperton side of London. Very little is known about the company except that it was swallowed up by one of the large conglomerates. 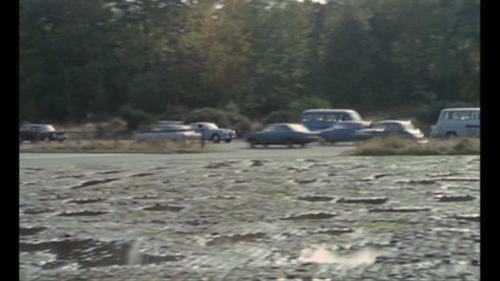 It seems unlikely that the film company would have gone all the way to Kent to use a Trident Garage. 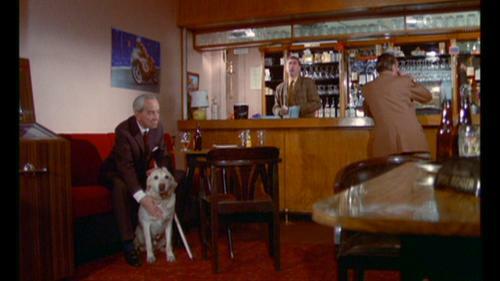 The Golf Club Bar on the MOD Test Track Site at Barrow Hill. Another view of the watersplash shown in 6. This time from a different angle showing that there is an adjacent footbridge. 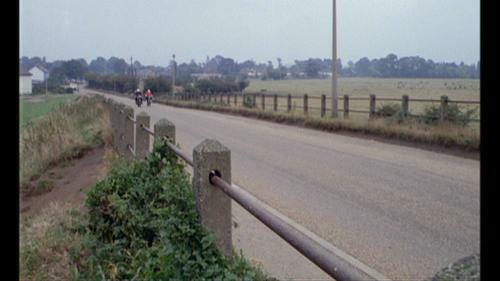 The cobble stones in the foreground of this screen capture are still visible to the north of the road segment on the map link below. This location appears once again to be close to the Queen Mary Reservoir, judging by the rise in the background. The area is now completely overgrown with trees. The old manor house at the golf club on the Barrow Hill military vehicle testing range. 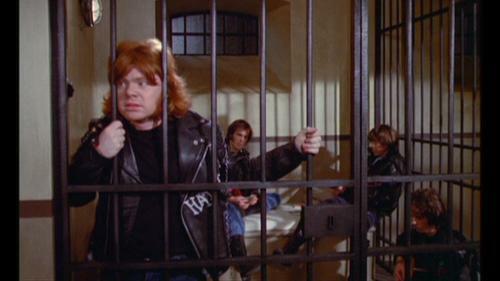 This is a made-up location, the Wall and window are real, the bars are constructed. 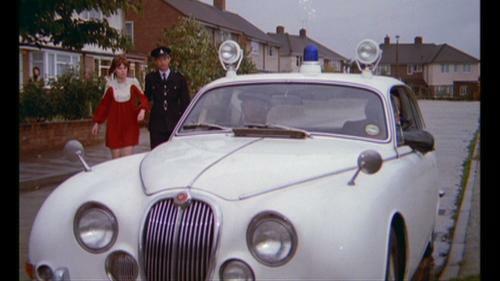 Whereabouts of building is unknown, probably somewhere on the Shepperton lot. 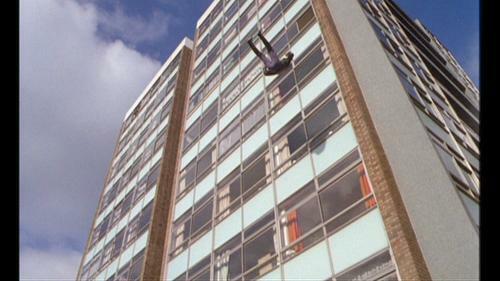 Block of flats opposite Hepworth Way Shopping Centre. Thames path by M3, although overgrown, the post stump is still there. Blackbushe Airport. Bertram is falling towards the end of the main runway. 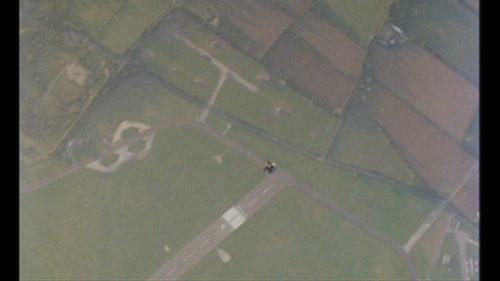 Two light aircraft runways have now been added to the left of this runway. 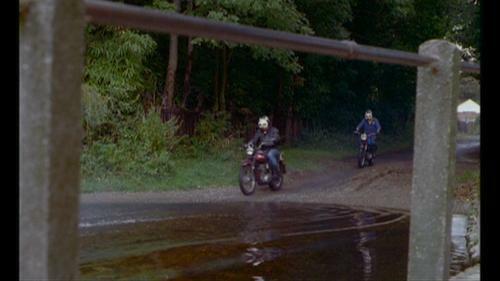 There are two bridges at this junction and sections of the scene were shot on each bridge for different angles. Although at this point the M3 is going East to West, traffic is always referred to as Northbound and Southbound and the bridges as the North Bridge and the South Bridge. Northbound is traffic going towards London and Southbound is Traffic heading away from London. The North Bridge is the bridge nearest London (East) and the South Bridge is the one furthest from London (West). 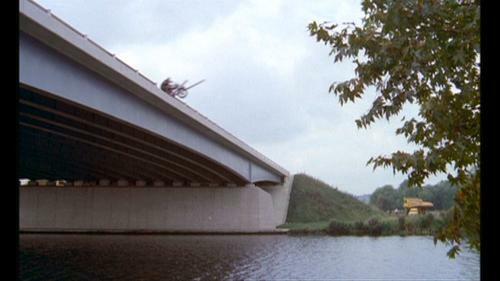 The first screenshot shows Hatchet parking his bike on the North Bridge on the South side above the Northbound Lane. The twin streetlight is still in position on the grass triangle behind. 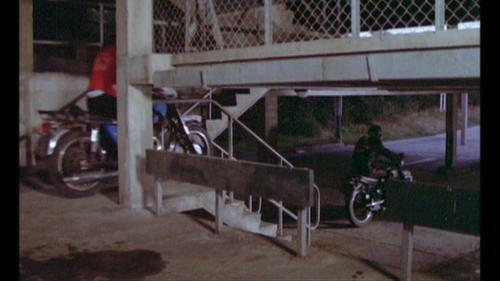 In the second screenshot you see Hatchet mounting the railing in the same position. You can tell by the curve of the bridge beneath. 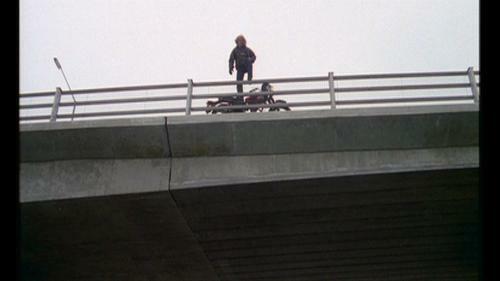 When Hatchet is falling, he is now falling from the North side of the North Bridge (the opposite side of the bridge) above the Northbound traffic. 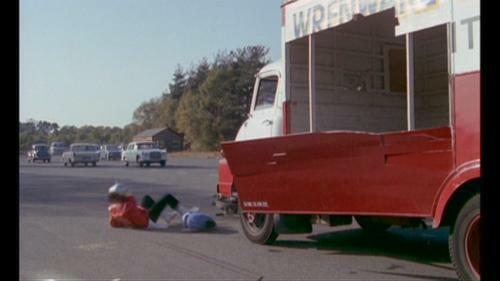 When Hatchet is laying under the Commer van, he is laying on the M3 on the North Side of the South Bridge on the Southbound side. The North Bridge can be seen in the background. 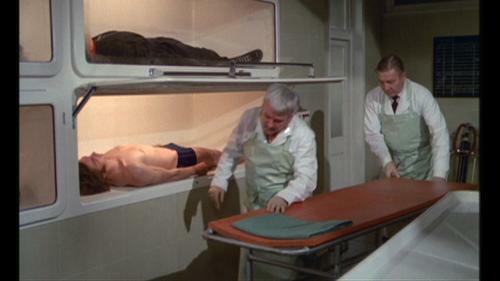 There is some dispute as to the location of this internal sequence. 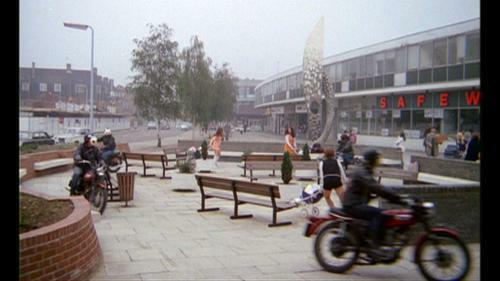 One person involved with the film says it was filmed in the Safeway at the Hepworth Way Shopping Centre, Walton-On-Thames. See 8 for exterior view. 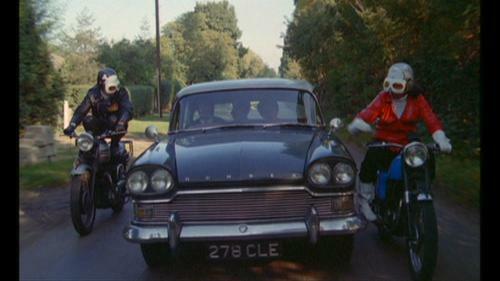 Another person involved in the film says it was filmed at the Fine Fare in Shepperton High Street. 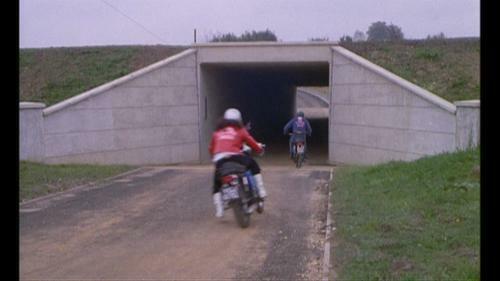 Another claim from a person who worked at Shepperton, but not involved with the film, is that between 1971 and 1974 a mock-up supermarket had been built inside an old prefab building next to the A316, and that nearly every film requiring a supermarket scene was filmed there until the place was demolished.